I found a very nice value for under $10. 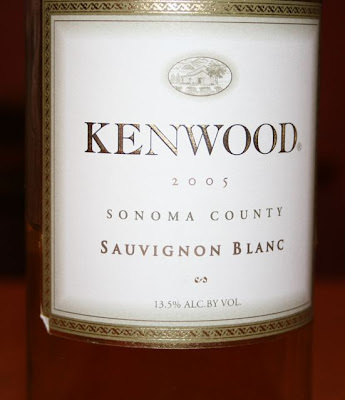 I’ve had Kenwood before and it has always been a pretty ok wine. But this 2005 zinfandel really kicked it for the $9 I dropped for it. It was solid and interesting and quite tasty. Even the color was dark almost inky purple. 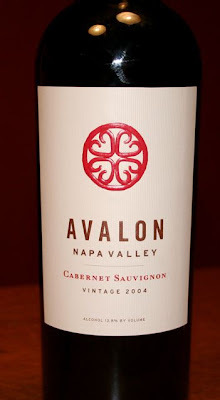 It was black cherries for days and days on the nose combining with hints of purple plums and spices. Those flavors came through in the mouth as well. Black cherry mixing with spicy apple pie and plums. It was quite smooth with soft tannins. The fruit was pretty big but not over the top. It didn’t reach that thick jammy stage. It was quite balanced and a very good value. I’d even serve this one to guests. I think it’s good drinking now. I’m not sure how long it will last. Probably not more than a few years. Greetings Wine Lovers! I want to share a couple of wines I had tonight. The first is a German pinot noir. A 2005 Hans Lang Maximilian Edition pinot noir to be exact. I haven’t experienced red wines from Germany before so I was excited to try this. Not unexpectedly it had a nice light color and aromas of acid and strawberries mingling with sour cherry candy. On the palate it was very interesting. First you get hit with a spicy black pepper that I just adore. Then your mouth tingles with fresh red raspberries and strawberries. It is certainly light and low on tannins but very interesting overall. The finish is subdued but clean. The acid is nicely balanced. It wasn’t razor sharp but did show its presence. Overall a very nice light pinot noir with an intriguing complexity. 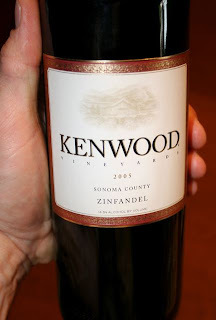 I fell in love with zinfandel in the early 1990’s when they were making big peppery zins in California. Lately the zins have been more sweet than spicy with tons of over the top jammy fruit. It’s not that I don’t like that but I miss the more refined fruit and black pepper of my youth. This 2003 Kenwood Jack London Vineyard zin is definitely made in the newer style. Right away on the nose you get huge blackberry jam. You can just tell it is fruity and almost sweet tasting from the aromas. On the palate, however, I was nicely surprised. It was jammy and full of black and red berries, but it wasn’t the over the top fruit bomb that I expected. Nice wood mingling with fruits and just a hint of that spice that I like so much. It is definitely zinny in all aspects. It is actually a nice marriage of the zins I remember from long ago and the zins being made today. I’ve got three wines to talk about tonight. The first is from Australia. 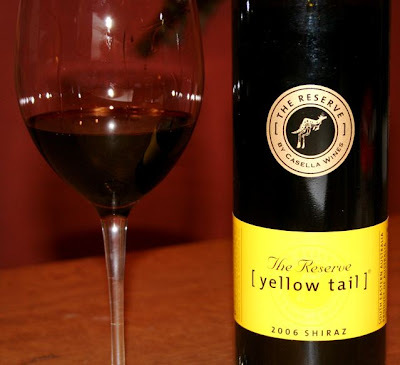 Everyone has heard of Yellow Tail. I find their mainstream wines to be rather boring and one dimensional. However, if you pay just a couple bucks more you get something actually worth drinking. Their “reserve” line of wines tend to be a significant step up from their regular fare. I like their reserve shiraz the best I would say. The 2006 had a gorgeous deep dark color. On the nose I got a complex mixture of vanilla and spice mingling with blackberries and coffee. There were nice big dark fruit flavors and cocoa on the palate and the wine had solid tannins. The only flaw I detected was that the alcohol was out of balance a bit. You did notice the hotness of the ethanol. Other than that for it’s 12 buck price point it is not a bad wine at all. I also got a taste of California recently. The first is a cabernet sauvignon from Napa valley. This is also a step up from their average “California” cabernet. I had the 2004 vintage last evening. It had nice plum and cherry aromas that carried through on the palate. There were chocolate flavors mingling with the fruit. The chocolate mostly came out on the mid palate. The finish was a little bit short but it was certainly a solid cab for $12. This evening I made a wonderful garlic, ginger, soy, mirin glazed fish for dinner. I was looking for a crisp fruit sauvignon blanc to go with it. 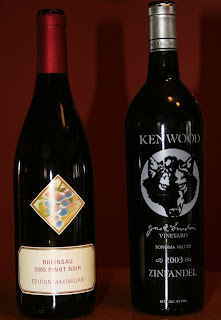 I was first thinking of one from New Zealand but I stumbled across a bottle fo the 2005 Kenwood from Sonoma county. This one paired very nicely with the steelhead trout tonight. It had a very pleasant nose of pears and grapefruit. It tasted of green apples and citrus. It had a nice silky texture and a reasonably long finish. There were also very nice grass and herbal components that married with dinner. It had a crisp enough acidity to cut through the fish. Overall I’ve had 3 for 3 this weekend.